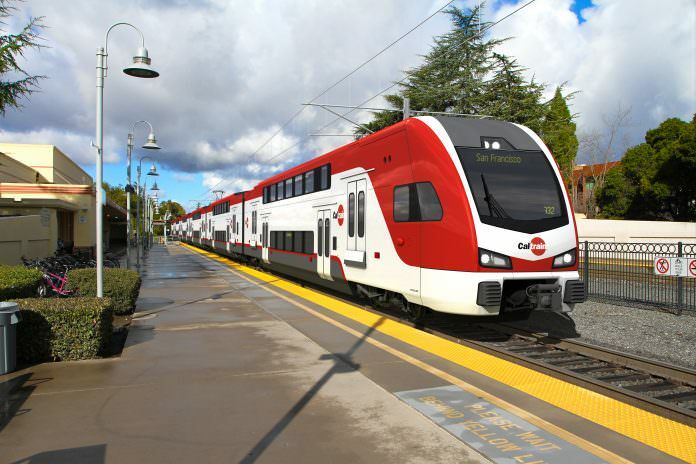 US officials have broken ground on the long-awaited Caltrain electrification project. Work to electrify the 84-kilometre Caltrain rail corridor between San Francisco and San Jose in California – known as the Peninsula Corridor Electrification Project (PCEP) – will now begin. A groundbreaking ceremony was conducted at Millbrae Caltrain Station on July 21 to mark the occasion. The event was attended by the Governor of California, Jerry Brown, and Congresswoman Nancy Pelosi, among others. Electrification will be completed in 2021 – 22 years after plans to electrify the line were first pursued. Caltrain has said the faster acceleration and braking that can be achieved with electric traction will allow it to provide more frequent, faster services. Caltrain has purchased a fleet of 16 six-car EMUs from Stadler US in Utah to operate the new electric service. The contract includes an option for up to 96 additional cars.